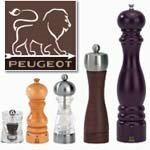 We have great prices on Peugeot pepper mills! Peugeot Pepper Mills are made in France according to very high quality standards. Peugeot pepper mills are the choice of discriminating cooks and food connoisseurs throughout the world. You will be proud to have these mills in your kitchen or on your table. Choose from traditional wood pepper mills or more contemporary acrylic and metal pepper mills. We also sell matching salt mills. Peugeot was founded in 1810 in France. They produced the first coffee mill in 1840 and in 1874 Peugeot made the first pepper mill for table use. Peugeot automobiles and Peugeot bicycles trace their history to the same beginnings. Peugeot pepper mills and salt mills are high performance professional tools. Unlike other brands, Peugeot's pepper grinding mechanisms are specifically designed for peppercorns and their salt mechanisms are specifically designed for salt crystals. Both the pepper mills and salt mills produce superior grinding results and the grinding mechanisms have a lifetime guarantee. Peugeot's latest innovation is the patented u'Select grind adjustment. This mechanism allows you to adjust the coarseness of the grind by turning a ring at the bottom of the mill. P.C. Fallon is proud to offer Peugeot pepper mills, the finest pepper mills in the world.